Gamers who were around in the 90s were fortunate enough to be exposed to the ‘golden era’ of real-time strategy (RTS), point and click and simulation games. During that time, a developer by the name of Bullfrog Productions created some of the most memorable titles in this genre. Some of my favourites, from the now defunct studio, include Dungeon Keeper II, Populous The Beginning, SimCoaster and Theme Hospital. The latter most title is of most interest to this post, because two original Bullfrog developers have come together to create Two Point Hospital – a spiritual successor to Theme Hospital. 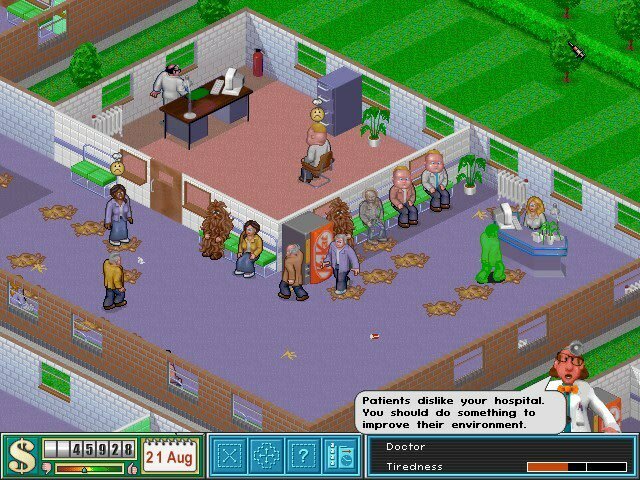 Some of the most memorable aspects of Theme Hospital were the unique diseases and illnesses that patients needed help curing. Thankfully, Two Point Hospital appears to be following in the footsteps that made the original game so much fun to play. Two Point Studios have already confirmed that Lightheadedness (having a bulb for a head), Cubism (when you are short of polygons) and The Emperors New Clothes (failing to realise you are naked) are three new diseases that have been confirmed for the new title. With that said, I thought it would be a good idea to have a look at five of my favourite diseases from the original title, and hypothesise whether or not they will make it into the new game, in one form or another. At some point or another, everyone experiences a swollen tongue. Whether that is from biting down on the tender organ by accident or from a recent visit to the dentist. However it happens, the effect is the same: being unable to talk properly. 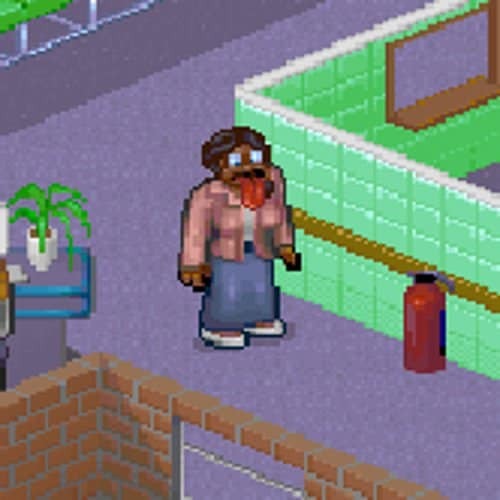 In Theme Hospital, Slack Tongue was the equivalent of this feeling, but multiplied exponentially (five times, to be exact). It was also caused by a “chronic over discussion of soap operas” and was solved by simply cutting off the enlarged bits using a Slicer Machine. Although Slack Tongue would do well in Two Point Hospital, I feel it could be updated for modern audiences. Perhaps as a new guise in the form of something like ‘Slack Jaw’ – caused by experiencing global stupidity via Internet videos. Suffering from a Broken Heart is a tale that is as old as time. It is a fundamental part of what it means to be human, to love, be loved and to experience the hurt that comes from that love being tarnished, torn away or discarded carelessly. In Theme Hospital, a patient suffering from a Broken Heart would not show any physical symptoms – much like in real life. However, they could be caught “tearing up holiday photos” and weeping uncontrollably. The cause for this morose pain? Coming in contact with someone who is “richer, younger and thinner” than the patient. In retrospect, this surgically solvable disease appears to be more about jealousy. Perhaps it could be updated in Two Point Hospital to reflect what happens when one drops their phone? After all, nothing makes your heart beat faster or more erratically than when that tiny black ‘love of your life’ slab slips through your fingers toward the ground below – hello ‘Shattered Heart’. Many of the original diseases from Theme Hospital are relatable in one way or another. With that said, I feel that Transparency is easily one of the most relatable. This is because of what brings it on: “licking the foil tops of opened yoghurt pots”. Those delicious yogurt laden foil tops. You know the kind I am referring to. Using your tongue to clean them completely, so much so that you can almost see your reflection in them, is a truly gratifying experience. Of course, doing this in the real world does not cause our bodies to be “rendered see-through and horrible”. Rather, one experiences the euphoria of consuming yoghurt in the most primal of ways. Perhaps an updated version of Transparency for Two Point Hospital could be a result of using too much social media. Whereby it renders the patient ‘invisible’ because they have lost their voice to the void of internet opinion; and the only way back is to go on a social media detoxification. Good old Bloaty Head. Easily the poster child for Theme Hospital. The one disease that was always immediately identifiable and a favourite to fix. Let us also not forget how it is caused: sniffing cheese and drinking un-purified rainwater – two things anyone could do! The cure was simple: the swollen head is popped and then re-inflated using a “clever machine”. Although Two Point Hospital does have a variation of this disease known as Light-Headedness, I do feel that it could be re-invisioned as some sort of Internet ego derived ailment. Perhaps along the lines of Influencer Brain, whereby a person has become so consumed with “likes” that their brain swells beyond normalcy to accommodate the ego boost from a popular post. It is well known that laughter is good for the soul. Unless it makes you snort or possibly choke on your tears. Even then, the endorphins that laughing releases certainly does have a calming effect on the troubles of the day. 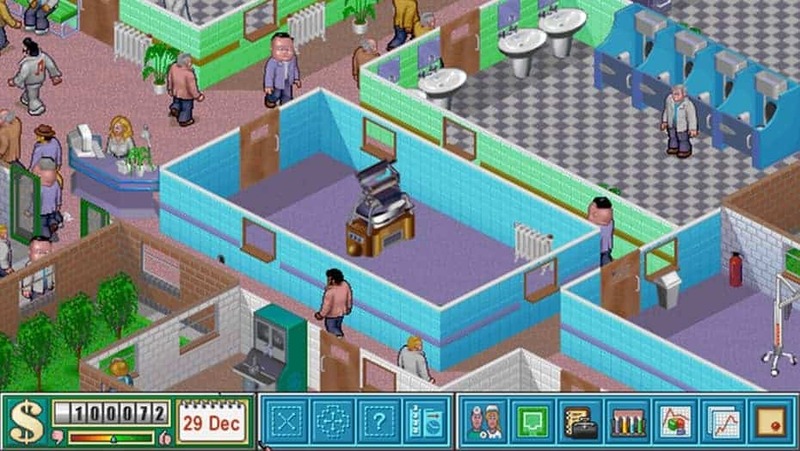 When it comes to ‘infectious laughter’ in Theme Hospital, it was initially caused by watching “classic situation comedy”, which would result in “helpless chortling and repetition of unfunny catchphrases”. A totally relatable disease. In order to be cured from this ailment, patients would need to book an appointment with a psychiatrist in order to be reminded of the “seriousness” of this condition. Thereafter, their lives would return to normal. In all honesty, the chortling is not that bad. It would be the unfunny catchphrases that would be of most concern. With Two Point Hospital, the same disease could be implemented in a similar manner. Instead of being caused by situational comedy, however, it could be more about binge watching series. Perhaps Binge Laughter could be a new disease; one that is caused by binge watching a series from start to completion, with the affect being uncontrollable and maniacal laughter from not knowing what to do now that the series has ended. Yet another relatable ailment. 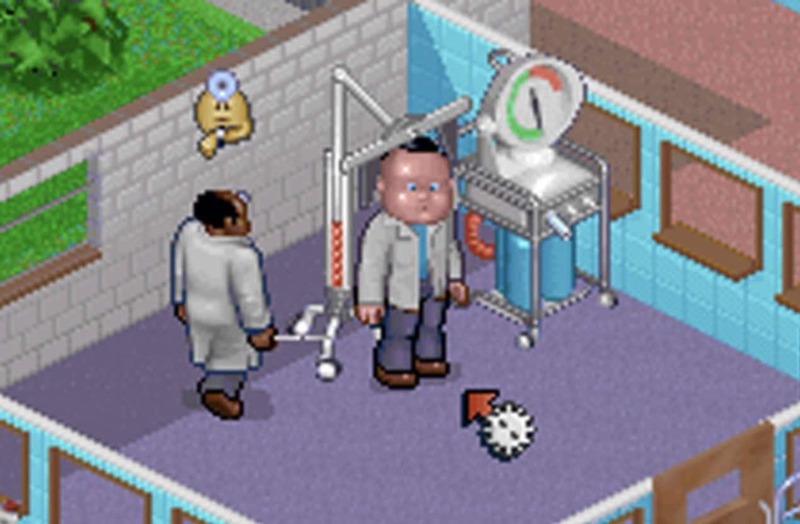 What were your favourite diseases from Theme Hospital? If you have any stand out memories, please feel free to share them below. Two Point Hospital is being developed by Gary Carr and Mark Webley from Two Point Studios. 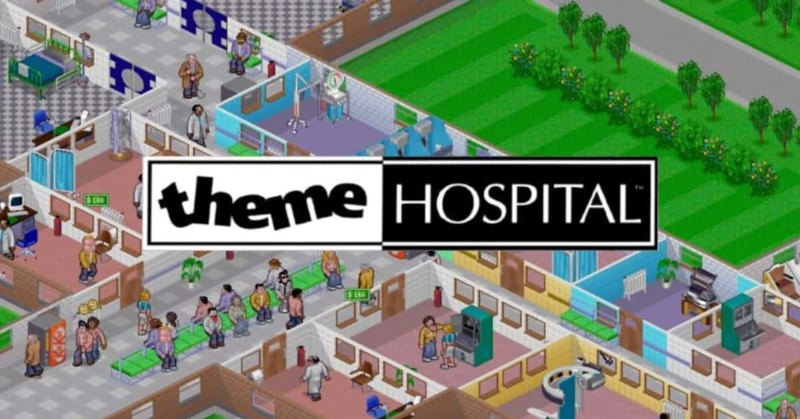 They are two of the original creators of Theme Hospital, and have worked on titles such as Black and White and Fable. As such, the spiritual successor to the 90s classic is definitely in very good hands. As a massive fan of sim games, especially those produced by Bullfrog Productions, I am very excited to get my hands on Two Point Hospital once it launches on the 30 August 2018.